Every eye color pairs differently with eye makeup looks. So, if you really want your eye makeup to look the best it can, it’s important to take your eye color into account when formulating your makeup looks. For example, a look that makes green eyes pop might not do the same wonders for brown eyes. The same goes for blue eyes. In fact, when it comes to blue eyes, formulating your makeup looks based on your eye color is even more important. When it comes to blue eyes, formulating your makeup looks based on your eye color is even more important. Blue is one of the most colorful eye colors. 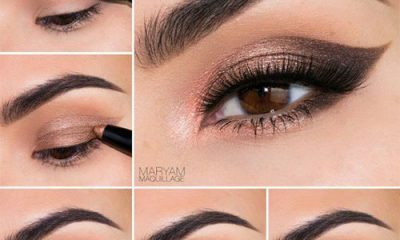 Therefore, which shades you use in your eye makeup looks make a big difference in how well the look complements your eyes. Determining which makeup looks complement your blue eyes can be a difficult and confusing feat. However, once you get the hang of figuring out which shades pair best with your specific blue eye color, it’s easy to produce looks that complement your unique eyes as well as possible. 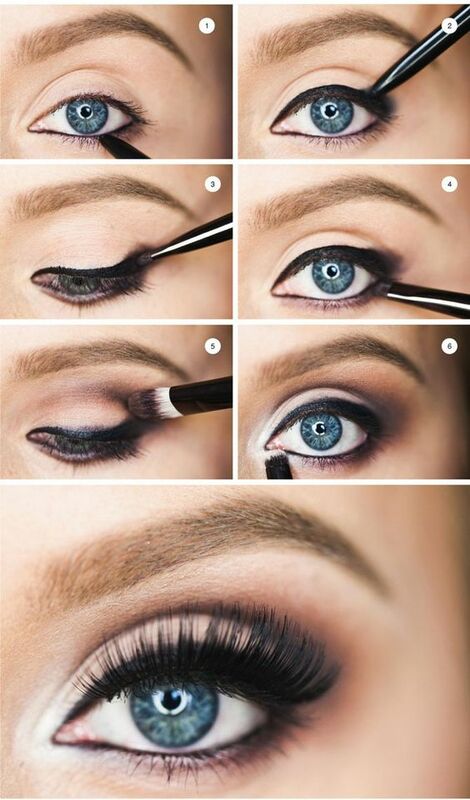 Eye makeup looks that are based primarily on shades of dark gray or charcoal are a wonderful complement to blue eyes. The cool gray brings out the coolness in blue eyes and makes their color pop. If you have warm flecks in your blue eyes as well, add a touch of copper shimmer to your gray makeup look to bring out the best of all the colors in your iris. Interestingly, both warm and cool-toned eye makeup looks tend to complement blue eyes. This is because most blue eyes have both warm and cool shades in them. 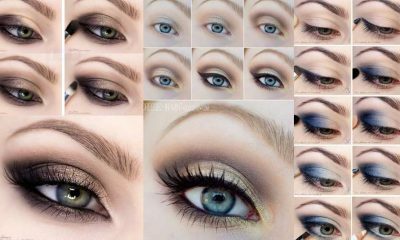 Dark gray looks bring out the cool tones while brown and gold looks like the one above make the warm parts of your eye color pop. Light, shimmery shadows create a beautiful complement for blue eyes. These light shades make your eyes appear bluer and clearer. Plus, eyeshadows with a shimmery finish act as an all-over highlighter to make your eyes look even brighter. A blend of light, shimmery eyeshadows with dark smudged liner creates a gorgeous, brightening and eye-popping look. 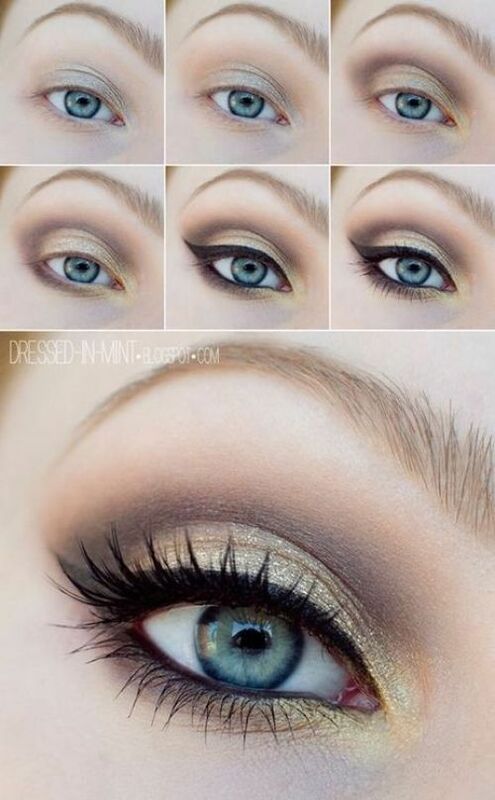 This beautiful dramatic look is perfect for blue eyes. The dark black eyeshadow across the eyelid brings out the cool blue tones in your eyes. Plus, the glittery golden liner across the bottom lash line brightens up your eyes and makes the warm tones present in them more apparent. If you’re looking for a gorgeous look for an upcoming formal event, this is an excellent choice. 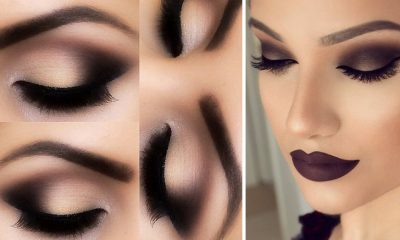 This makeup look combines both warm and cool-toned eyeshadow shades in a grunge-inspired masterpiece. 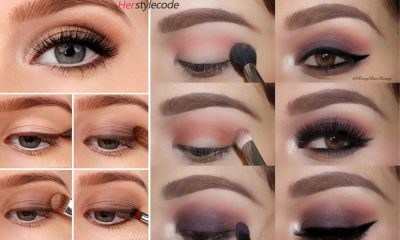 The dark gray eyeshadow on the center of the eyelid creates a dramatic contrast that makes the whites of your eyes appear brighter. Then, the matte gold shades toward your brow bone bring out the warmth in your irises for an incomparably flattering combination. Light eyeshadows in shades of white, pink, and silver create a flattering complement to blue eyes. Plus, eyeshadows with a shimmery finish lighten and brighten blue eyes for a gorgeous, clearing effect. However, when you use light and shimmery eyeshadows, it is important to apply dark eyeliner around your lash lines. This liner creates a buffer around your eyes that helps your eye color pop more obviously. This simple and easy-to-follow tutorial does exactly what it claims. It makes your blue eyes sparkle like you never before thought possible. The look uses a variety of colors that are naturally complementary to blue eyes. It primarily includes shades of eyeshadow with warm tones. These shades effectively bring out the warmth in your blue eyes. Also, this beautiful look includes a mixture of both matte and shimmery shadows. The mixture of finishes creates a gorgeous balance of brightness and drama. Just remember that blending is key to the success of any look, especially one that includes multiple shades and finishes. Don’t be afraid to use a blend of bright colors to make your blue eyes pop. In fact, if you use the right bright colors, these shades can be extremely effective at complementing your blue eyes. 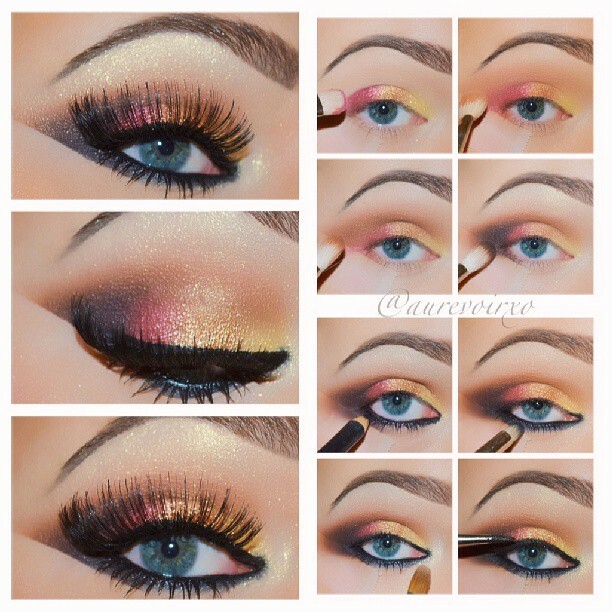 A blend of bright pink, gold, and charcoal gray like in the look shown above creates a brightening, widening, and overall complementary effect on your eye color. 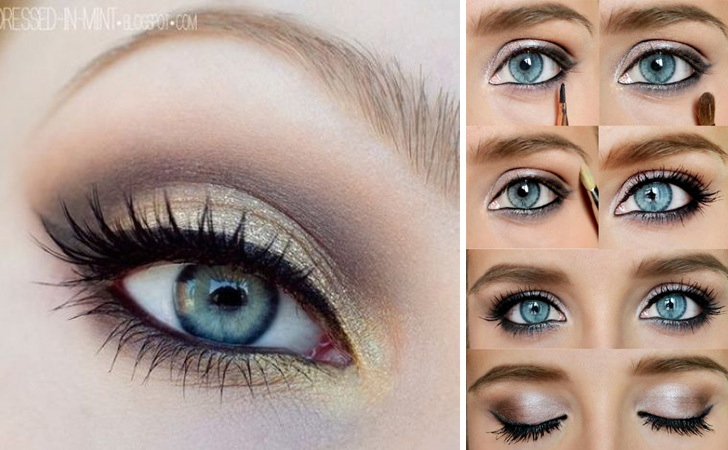 A blend of brown and pink eyeshadows is the perfect way to bring out the best in blue eyes. The pink eyeshadow contrasts beautifully with the blue in your eyes and makes them appear even bluer. 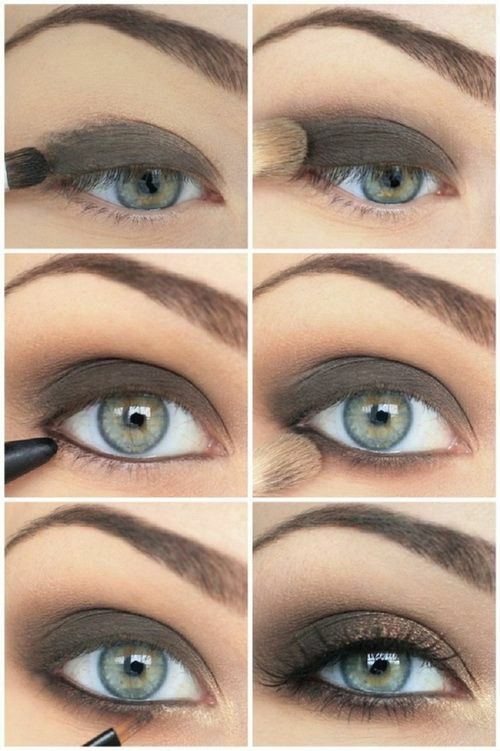 Plus, the brown eyeshadow makes the whole look appear more sophisticated and dramatic to create a flattering balance.